Provide comfort for the family of Alex Cano, Sr. with a meaningful gesture of sympathy. Alex “Cheo” Cano, Sr., age 64, of Seguin and formerly of Leesville, entered eternal rest on January 29, 2019 in San Antonio, Texas. He was born in San Antonio, Texas, on November 19, 1954, to Helario and Teodora DeLeon Cano. Alex was preceded in death by his parents. 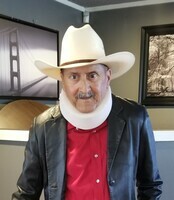 He is survived by his wife, Mary Rangel Cano; his son, Eliseo Cano Jr.; his daughter, Christina Hammonds and husband Ahmad; his grandchildren: Bailey Cano, Brayden Porter, Jordan, Chris, Rashad, and Jasmine Hammonds; brothers: Larry Cano and Charlie Cano; his sister, Dora Peña and husband Johnny; numerous nieces and nephews, as well as other loving family and many friends. Visitation will be held Thursday, January 31, 2019, from 4:30 PM – 8:00 PM at Finch Funeral Chapel in Nixon with a Rosary recited at 6:30 PM. Father Ouseph Kuriakose will officiate with burial in the Leesville Latin American Cemetery following the mass. Pallbearers: Chris Cano, Charlie Cano, Joseph Peña, Brayden Porter, Ahmad Hammonds, Jordan Hammonds, Chris Hammonds, Rashad Hammonds, Robert Rangel, and Elias Castro Jr. Memorial contributions may be made to the National Kidney Foundation. To send flowers in memory of Alex "Cheo" Cano, Sr., please visit our Heartfelt Sympathies Store. Love, Dena, Jay, and Jaren Cano, Kobe, Monica, Brandon, Stephanie, and others have sent flowers to the family of Alex "Cheo" Cano, Sr..
Love, Dena, Jay, and Jaren Cano purchased flowers for the family of Alex Cano, Sr..
Kobe, Monica, Brandon, Stephanie purchased flowers for the family of Alex Cano, Sr..
Estimada familia Cano, Por favor acepten mi más sentido pésame y mediten en la bella promesa que encontramos en Juan 5:28,29- “No se maravillen de esto, porque viene la hora en que todos los que están en las tumbas conmemorativas oirán su voz y saldrán, los que hicieron cosas buenas a una resurrección de vida, los que practicaron cosas viles a una resurrección de juicio.” Todos tenemos la oportunidad de vivir para siempre. También la tendrán nuestros seres queridos que han fallecido. Podemos confiar en esto.